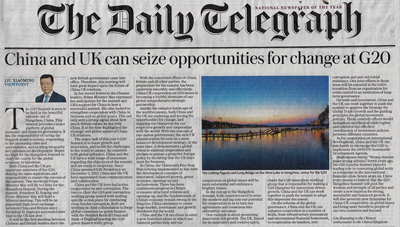 The Daily Telegraph Publishes A Signed Article by Ambassador Liu Xiaoming Entitled "China and UK can seize opportunities for change at G20"
The G20 Summit is soon to be held in the beautiful lakeside city of Hangzhou, China. This summit provides a major platform of global economic and financial governance. It has the responsibility of curing the sluggish world economy, responding to the increasing risks and uncertainties, and tackling inequality and unbalanced development. Hopes are high for the Hangzhou Summit to chart the course for the global economy in transition. Both China and the UK are important members of the G20, sharing the same aspirations and responsibility to ensure the success of the summit. This weekend Prime Minister May will fly to China for the Hangzhou Summit. During the summit, President Xi Jinping and Prime Minister May will hold a bilateral meeting. This will be an important high-level exchange between China and Britain since President Xi Jinping's successful state visit to the UK last year. It will be the first meeting between Chinese and British leaders since the new British government came into office. Therefore, this meeting will have great impact upon the future of China-UK relations. In her recent letters to the Chinese leaders, Prime Minister May expressed her anticipation for the summit and UK's support for China to host a successful summit. She also looked to strengthen cooperation with China in business and on global issues. This not only sent a strong signal about how much Britain values its ties with China. It at the time highlighted the strategic and global nature of China-UK relations. The major task of this year's G20 Summit is to boost growth and innovation, and tackle the challenges to the world economy. As countries with global influence, China and the UK have a wide range of consensus regarding the objectives of the summit and are ready to cooperate. Since China assumed G20 Presidency on December 1, 2015, China and the UK have maintained close communication and collaboration. China and the UK have had active cooperation on anti-corruption. The two co-chair the G20 anti-corruption working group tasked with making specific action plans for combating cross-border corruption. Both are working in close collaboration to forge global consensus on green finance, with the People's Bank of China and Bank of England heading the G20 green finance study group. With the concerted efforts of China, Britain and all other parties, the preparation for the summit has been underway smoothly and effectively. China-UK cooperation on G20 issues is becoming a fruitful showcase of our global comprehensive strategic partnership. Amidst the complex landscape of the world economy, both China and the UK are exploring and seizing the opportunities for change, and mapping out blueprints for our respective growth and cooperation with the world. With the concept of one-nation government, the new UK administration focuses on a more balanced development strategy. At the same time, it demonstrates a global vision in external cooperation and pledges to pursue a proactive foreign policy by declaring that the UK stays open for business. In China, the Thirteenth Five-Year Plan is being implemented in line with the development concepts of innovation, balanced growth, green economy, opening-up and inclusiveness. There has been continuous progress in China's economic structural reforms and opening-up, and the fundamentals of China's economy remain strong in the long run. China continues to create huge market, investment and growth dividends for the world. China and the UK are about to enter a new historical phase in which our bilateral partnership and our cooperation on global issues will be more substantial and embrace a brighter future. In the run up to the Hangzhou Summit, both countries need to seize the moment and tap into our potential for cooperation so as to turn our agreements and consensus into substantial outcomes. One example is about promoting innovation-led growth. The UK, famed for its innovative and creative spirit, chairs the G20 innovation working group that is responsible for making a G20 blueprint for innovation-driven growth. China and the UK can work together to push the summit to adopt this important document. On the reforms of the global governance, China and the UK can enhance cooperation in a number of fields, from infrastructure investment and international financial framework, to cooperation on taxation, anti-corruption and anti-microbial resistance. Our joint efforts in these areas will be essential in the G20's transition from an organization for crisis control to an institution of long-term governance. On trade and investment, China and the UK can work together to push the summit to approve the Strategy for Global Trade Growth and the guiding principles for global investment policies. These concrete efforts would strengthen multilateral trade regime and reinforce the effective coordination of investment policies between different countries. As for cooperation on international development, China and the UK can join hands to encourage the G20 to implement the 2030 UN Sustainable Development Agenda. Shakespeare wrote: "Strong reasons make strong actions." Seven years ago, the G20 London Summit played a leading role in cementing global unity as a response to the international financial crisis. Seven years on, I have every reason to believe that the G20 Hangzhou Summit will pool the wisdom and strength of all parties and create a new impetus for strong, sustainable and balanced growth. It will also generate new dynamism for China-UK cooperation on global issues and bring more benefit to people of our two countries and beyond.